Wärtsilä introduced its new Nacos Platinum solid state S-Band radar system at the SMM trade fair in Hamburg. The next generation marine radar offering promotes safety via optimized target detection, regardless of the prevailing environmental conditions, the manufacturer said. Furthermore, the compact design enhances system reliability, while the elimination of a magnetron creates a reduction in maintenance costs compared to conventional radar systems. "Wärtsilä's smart marine vision is to utilize the latest technologies, together with high levels of digitalization and connectivity, to ensure even greater efficiencies and added safety. We see this as being essential to ensure sustainable profitability for our customers' operations. The new solid state S-Band radar system is entirely in line with this thinking," said Eberhard Maass, Product Manager, Navigation Systems, Wärtsilä Marine Solutions. 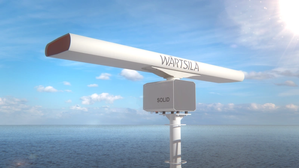 Wärtsilä said its Nacos Platinum radar systems are an integral part of the company's navigation offering, with particularly strong market penetration in the cruise, ferry and luxury yacht segments. The solid state system is expected to enhance this market position even further, the company said. The first units are scheduled for delivery in mid-2019.